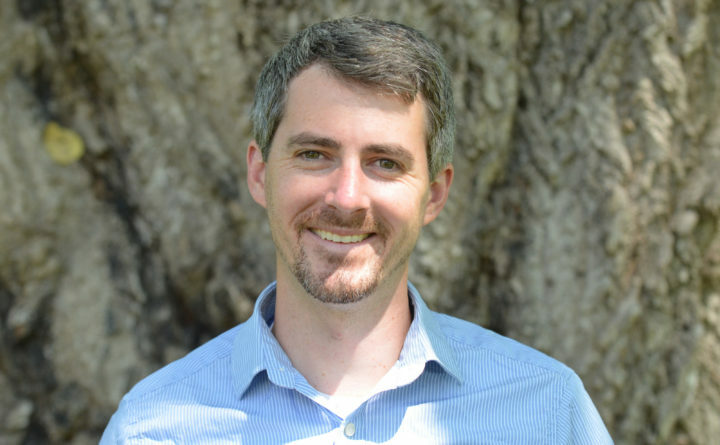 BAR HARBOR — College of the Atlantic is pleased to announce the appointment to the faculty of chemist Reuben Hudson, Ph.D.
Hudson is passionate about the intersection of chemistry and sustainability. For years he has worked to hone techniques of utilizing metals within chemical reactions in ways that conserve material and reduce waste. His research also centers around designing and synthesizing new materials for use in hydrogen fuel cells. Hudson’s teaching will focus on environmental, organic, and green chemistry. As part of his work, Hudson makes tiny magnetic particles — visible only with an electron microscope — that can be used to facilitate chemical reactions that would be extremely slow or not work at all without these metals. Because the particles are magnetic, they can be retrieved at the end of the reaction by placing a magnet next to the container. They can then be reused repeatedly for subsequent reactions. He’s also worked to develop strategies for immobilizing non-magnetic metals on different materials which can likewise be easily recovered after reaction completion. “Without using techniques like this, we would be wasting precious metal material at each reaction, and that is just not sustainable enough for my tastes,” Hudson says. Researching and developing materials for hydrogen fuel cells has been a passionate pursuit, Hudson says. Teaching chemistry is very rewarding, says Hudson. He comes to COA after several years at Colby College, attracted by COA’s culture of sustainability. Hudson holds a Ph.D. in chemistry from McGill University and a B.A. from Vassar College. In his free time, he enjoys whitewater kayaking and backcountry skiing with his wife, Kit. College of the Atlantic believes that education should go beyond understanding the world as it is to enabling students to actively shape the future. COA is a leader in experiential learning and environmental stewardship, and is the Princeton Review’s #1 Green College 2016-2018. Every COA student designs their own major in human ecology—which integrates knowledge from across academic disciplines and seeks to understand and improve the relationships between humans and their natural, built, and social environments—and sets their own path toward a degree. The intentionally small school of 350 students and 35 faculty members was founded in 1969 and offers Bachelor of Arts and Master of Philosophy degrees. Learn more at coa.edu.